Many of the more popular countries in Europe are divided into regions. 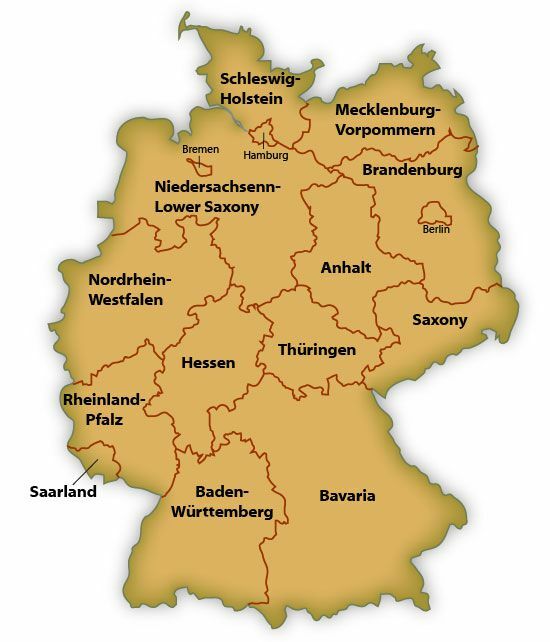 Germany is instead divided into 16 states or Bundesländer. Two of the states you see on the map are what might be known as city-states. They are Berlin and Hamburg. Bremen and Bremerhaven combine to become a third city-state. The rest are Flächenländer or area states. The largest state is well known to tourists. The Free State of Bavaria (Freistaat Bayern) is a popular tourist destination. Its size makes up almost a fifth of the total land mass of Germany. The capital is Germany's third largest city and popular tourist destination Munich. Get out of the city to see Ludwig's romantic castle Neuschwanstein. The state with the greatest wine production (and some wonderful castles) is Rheinland-Pfalz. You can experience the wines best on the German Wine Route in Pfalz. Wealth? The state of Baden Wurttemberg is Germany's wealthiest states and is home to the largest German company Daimler Chrysler. Germany borders 9 countries, all easy to get to by rail: Austria, France, Switzerland, Denmark, Belgium, Luxemburg, Holland, Czech Republic, and Poland. Germany has coastline on the North Sea and the Baltic. Germany is visited year-round. Unlike the Mediterranean countries which see little rain in summer, the temperate climate of Germany produces warm summers and cold winters. Much of the rain comes in the summer in most places; only the southwest sees a bit of Mediterranean climate--and this is where the vines thrive. Winter is actually a bit of high season in Germany, due to the popularity of Christmas markets and the necessity of providing tourist access to them in any weather. Cities like Berlin are visited all year. The city gets about 33 inches of precipitation, about a quarter of it snow. For historic climate charts, current weather and city maps, see Germany Travel Weather. Bavaria is the most popular German state for tourists. In 2008 tourists spend 76.91 million nights there. Baden - Wurttemberg was a distant second, with 43.62 visitor nights. On the north coast, the state of Mecklenburg-Vorpommern has the highest density of tourists. Visitors from the Netherlands made the most visits, followed by tourists from the United States.